Interpreting star test OF versus IF? 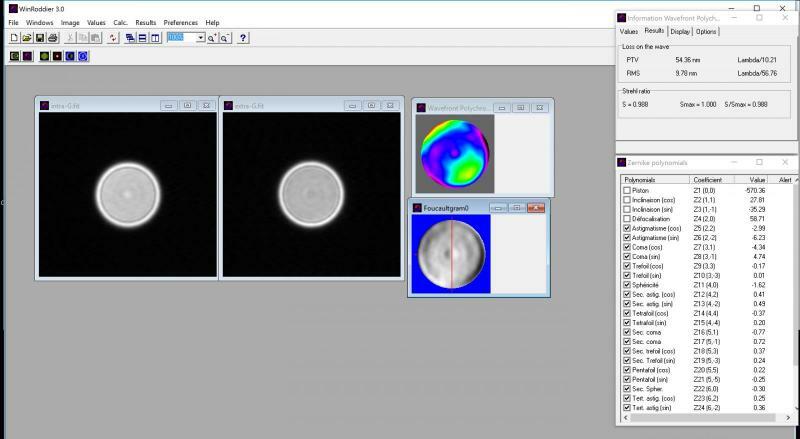 I've owned an Espirit 120 refractor since mid-2016, about a year after I purchased it I decided to perform a series of Roddier tests to evaluate the optics. One immediate finding was the apparent sensitivity of Roddier to seeing conditions, on two separate nights the software reported (in green light) a P-to-V of lambda 3.3 and lambda 4.4, strehls were reported up to 0.924. So, I concluded the lens was diffraction limited but results weren't reproducible. I've attached below the outside focus OF and inside focus IF images taken during one Roddier test. Of course I was hoping to see smooth, nearly identical images. But, there's a small central zone and a fainter ring zone at about half radius. Given the lack of reproducible results, I am wondering if anyone with more experience in interpreting star tests could comment on the probable effect of these imperfections? Visually, the scope performs fairly well on Jupiter under average sky conditions here which is my acid test for quality, it reveals details that are marginally ahead of my 4 inchers. Maybe I'm expecting too much from a 4.7 inch aperture, however Espirits generally receive rave reviews so this could be a mediocre example of the line. Edited by Loren Toole, 15 April 2019 - 10:19 PM. First of all, have you applied exactly the same number of defocus waves when taking IF and OF images? In order to average the effect of seeing and obtain more consistent results, you should target a star at zenith. Take about 1min video then stack the frames using autostakkert (one align point would do). There are clearly 2 zones,but otherwise IF and OF look very similar, hence the 0.92 result. What is the dominant aberration according to your Roddier test? Edited by TonyStar, 15 April 2019 - 11:10 PM. These dont look bad. The outer ring zone is weak. The center zone is small -- light from this small zone will be spread into a 5 to 10 arcsecond halo which you will never notice. More importantly, the edge looks crisp in both -- theres no turn edge. 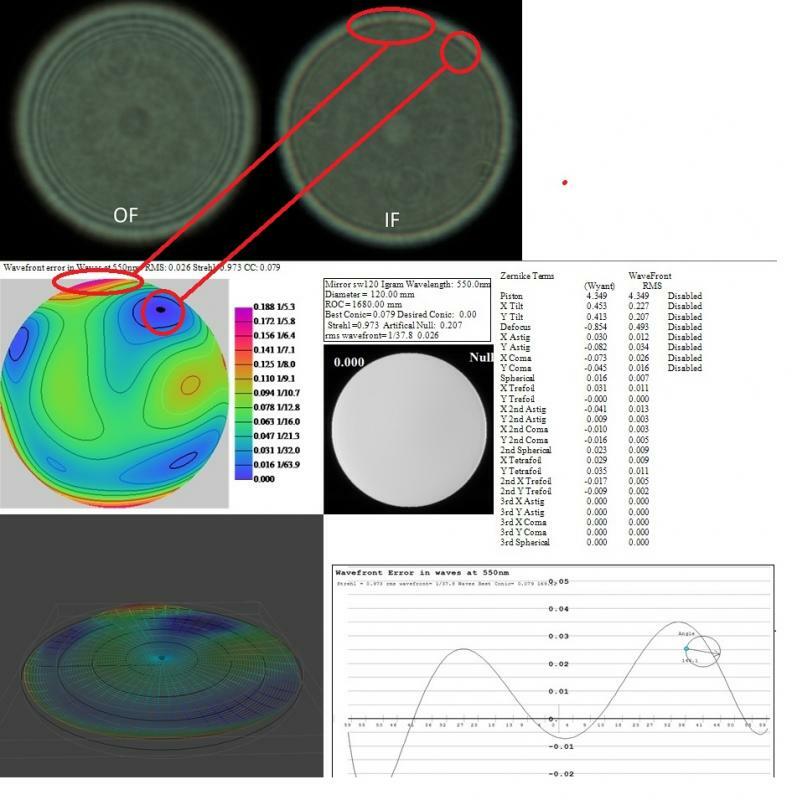 However, for visual star testing, for judging low-order spherical and astigmatism, etc., you would want images much closer to focus. Images showing 5 rings or less would be much better for visual estimation. 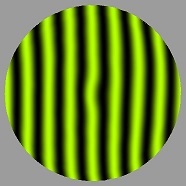 I like images at around 2 or 3 rings to see what is going on. For the Roddier test, I was careful to match pixels to within a couple of the recommended defocus radius (this was more difficult than it sounds in my typical seeing) and of course I used a star near zenith. AS was used for the OF, IF images shown in my first post. 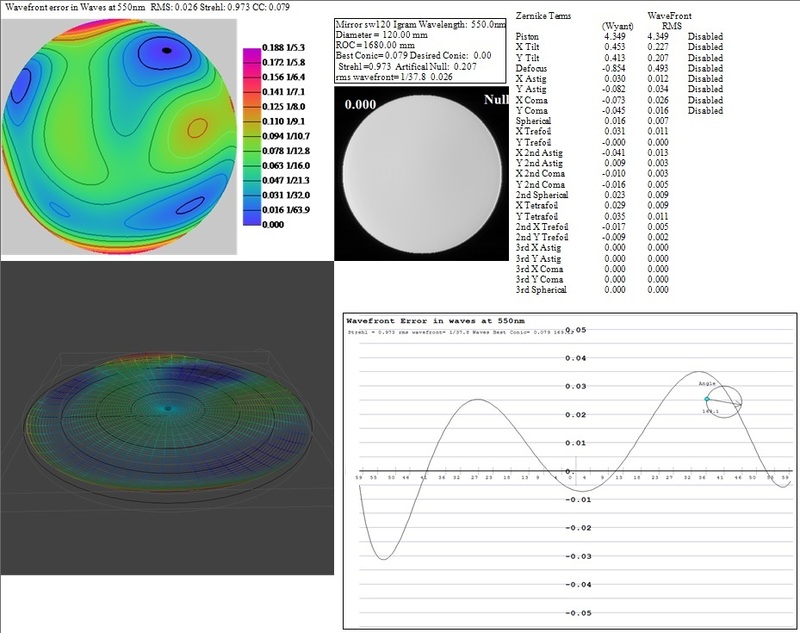 I also exported the Zernike data to OpenFringe because the surface profile plot is more meaningful to me, and I received the report below.... note the dominant error is 2nd order astigmatism, and strehl is now reported as 0.97. Given the spread of values between Roddier and OpenFringe, is there any likely consistency here? One way to reduce these effects is to let the star trail on the detector a bit, and then align and stack the frames. That helps to average out dust spots, etc. It also helps average out the seeing. I've generally done that with images for Roddier. The Roddier software is trying to extract a lot of information from tiny brightness variations in the images, so dust spots, etc. will be bad news. Do you have the surface map output by Roddier? I must admit I haven't used it for a while, but it used to output a surface map. I am not sure why Roddier and Open Fringe would disagree. They are both working from the same Zernikes? Maybe there is a scaling issue somewhere. Software for mirrors often has a factor of 2 floating around somewhere due to the difference between "surface errors" and "wavefront errors." Edited by ngc7319_20, 16 April 2019 - 08:55 AM. 0.92 and 0.97 sound more different than they are. Depending on the precise technique used, they may well be withing the measurement error of whatever true value. The way I understood it, you based the analysis on real star images. I am almost certain that the spread that you see under these circumstances simply reflects measurement error. 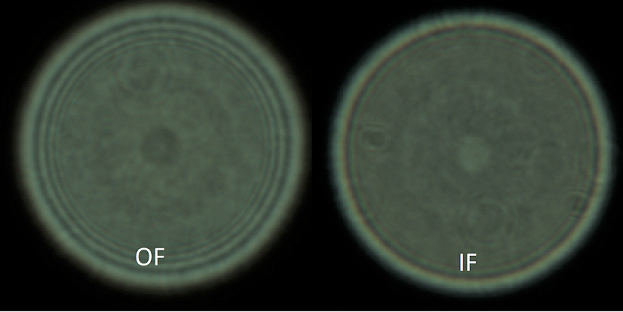 Sometimes it is mentioned that even under lab conditions, you could get errors of 0.02 to 0.03 requiring the same lens to be tested several times to arrive at a robust average. Anyway - in this quality range really a theoretical/academic issue. Thanks for all of the useful comments, agreed there are un-reproducible measurement errors, the range of strehls reported by Roddier and OpenFringe maybe reconciled as a result. I hadn't considered the effect of dust on the camera chip, I was aware of them in the images. I may try another imaging run after carefully removing all dust. Roddier only outputs an interferogram, not surface profile. See that image below...it does pickup the central zone but other features seem to be too subdued to draw conclusions from this specific report. Edited by Loren Toole, 16 April 2019 - 12:52 PM. You should be able to output surface profile as well as a simulated foucaultgram. This is an example with Roddier 3.0.